CHICAGO – Upon returning to Springfield for special session on Wednesday, House Minority Leader Jim Durkin (R-Western Springs), Senate Deputy Republican Leader Bill Brady (R-Bloomington), Assistant Senate Republican Leader Jason Barickman (R-Bloomington), Senate Republican Caucus Whip Karen McConnaughay (R-St. Charles), Senator Dale Righter (R-Mattoon), Deputy House Republican Leader Patti Bellock (R-Hinsdale), Deputy House Republican Leader Dan Brady (R-Normal) and House Republican Conference Chairperson Tom Demmer (R-Dixon) offered a reminder that a compromise balanced budget with reforms is on the table and ready to be enacted. “Last Wednesday we introduced a compromise budget and reform plan that respects the priorities of both parties and puts us on a path to end the impasse if the Democrats will agree to engage with us. The provisions included in our plan have been thoroughly vetted. With only ten days left in the fiscal year, we don’t need more Committees of the Whole. We need immediate action!” said Durkin. Senate Republican Leader Christine Radogno (R-Lemont) called the package “a reasonable compromise that will allow Illinois to move forward. We have to work together to enact a state budget and the reforms necessary to make it work.” Leader Radogno was unable to attend but urged action in the General Assembly. “The time is now,” she said. 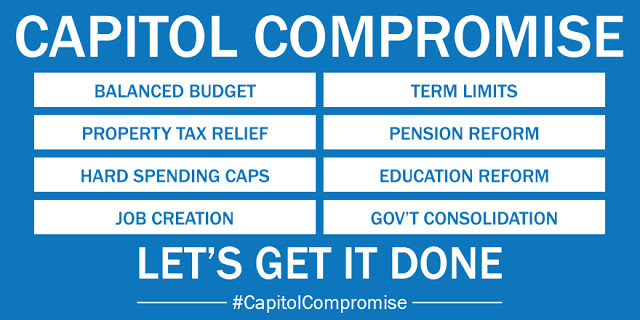 The comprehensive proposal includes a truly balanced budget, a four-year hard spending cap, lasting property tax relief, and changes to our regulatory system that will create jobs and grow the economy. The bills also include a $288 million increase for the new school funding formula, as well as additional funding to fulfill commitments to restore child care eligibility to 185% of the federal poverty level and a wage increase to Direct Support Professionals. It also includes term limits on legislative leaders and constitutional officers. Budget Bills (SB 2176, 2214, 2215, 2216, 2217, 2218): Comprehensive budget proposal that includes real spending cuts and a four-year spending cap, while providing funding to state agencies like the Department of Human Services to care for our state’s most vulnerable and the Department of Transportation to continue important infrastructure projects. Property Tax Relief (HB 4066) Four-year freeze for all taxing districts, but would allow residents, through a voter referendum, to lower or increase their taxes. Allows for an exemption on existing debt service payments as requested by Senate Democrats. Local Government Consolidation (HB 4067): Strengthens and improves the already passed SB 3, and will allow for citizens-initiated consolidation on units of local government. Education Funding (SB 1124, HB 4069): Changes to the K-12 education funding formula that treats every district equitably that is consistent with the bipartisan framework of the Governor’s School Funding Commission. Funding for early childhood education, K-12 education, community colleges, and universities. Workers’ Comp (HB 4068): Uses previously negotiated language between Senate GOP and Senate Democrats, like changes to the medical fee schedule, but does not reduce benefits to workers or include a causation standard. Pension Reform (HB 4064): Accepts SB 16, which has previously passed the Senate, including President Cullerton’s consideration model and the state’s pickup of Chicago Public School’s pension payments. “Putting government consolidation in the hands of local voters is the right thing to do to reduce the cost of government in Illinois. Unlike so much coming out of Springfield, this is not a mandate but an empowerment tool. We have over 7,000 units of local government and our property taxes prove unsustainable. Between pension reform and government consolidation, we can reduce the cost of government for taxpayers and right-size our services and costs,” said Representative Demmer.